The children from 3rd, 4th and 5th grades at “Hristo Yassenov” School put in a lot of imagination and talent into creating the Partnership’s Travel Mascot. 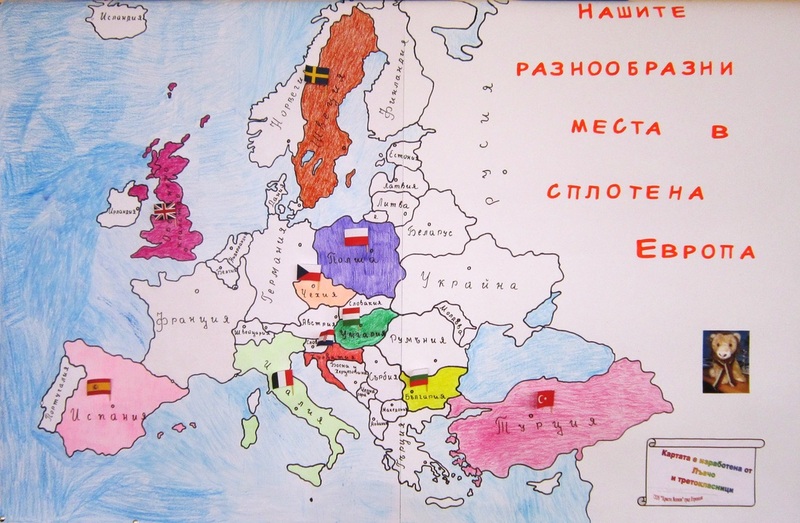 The final winner of the competition was Lavcho, drawn by Nadya Misheva, 5th grade. And here are some of the runners-up. 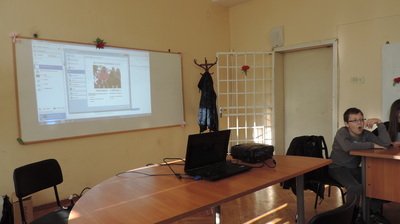 A video conference with students from the fifth grade in our school and their new Polish friends was held in November 2013. The students exchanged information about their countries, towns and school life in English. They sang songs in their native languages and learned how to say “Hello” and “Goodbye” in their new friends’ language. All the students from our school who participated in the video conference enjoyed it very much. They are now impatient to take part in a future one with great enthusiasm. Such activities are very useful and challenging for students and strengthen their motivation for studying foreign languages and learning new things about different countries and cultures. In winter, when it snows white and forests and fields fall asleep in hibernation, we celebrate the brightest holiday – Koleda (Christmas). Our preparation began weeks before Christmas. We decorated our classrooms, arranged an exhibition, participated in a charity bazaar and got ready for our party. Traditionally, on the early morning of December 24 the housewife wakes up everybody at home. We , the well-behaved children get up and start preparing for the festival. The girls help their mother and grandmother with cooking and the boys and men choose the most beautiful fir tree and bring it home. Grandma has kneaded the bread and has put a coin in it- for good luck. We lay on the table only what land has given us - beans, stuffed peppers and sarmi (vine and cabbage leaves stuffed with rice), pumpkin and cabbage pie, nuts and fruit, honey.The number of dishes should be uneven-seven(as the days of the week), nine( as the months a baby is carried by mum) or they could be 12(as the months of the year).We arranged all the delicious dishes we had cooked together with our mothers and grandmothers on the table at school. Everybody ate their fill. Shortly before midnight, the householder puts a Yule log / a thick log / in the fire. If the wood burns down until the morning, the year will be profitable and rich for the family; if it does not burn down, there will be difficulties and distress. Hopefully ,our Yule log will burn down! May all be full, free, cheerful and happy! For children - wonderful festivities, delicious sweets, games! May girls be dressed as beautifully as stars so that all lads like them! May young men be strong, joyful and healthy - so as to please girls both at work and fun! May all people on earth live as brothers! Let it be! And then at midnight sharp Christmas bells ring and announce Christmas - Jesus Christ is born, the Saviour has come to this world. Such is the magic of the night before Christmas. And on Christmas day all are together again at home and enjoy the gifts left by the best man – Father Christmas. May our days be filled with faith, patience, strength, lots of health and hope! Bulgarian pumpkin banitza (or banitsa) is also known as tikvenik and is a dessert version of savory cheese banitzi made with flaky filo dough and either fresh or canned pumpkin. Other sweet fillings include apple and walnut. If using canned pumpkin, transfer to a bowl and add sugar, walnuts and cinnamon, mixing well. Portion out a 1/2-inch strip of filling along either the 12-inch edge if you want an "S"-shaped scroll, or along the 8-inch edge for a cigar-shaped roll and 1/4 inch away from the edges. Fold up bottom edge first, then sides and then roll away from yourself until you have a tight cylinder. Brush lightly with more melted butter. Banitsa (pronounced BAH-nit-sa) is a traditional Bulgarian pastry prepared by layering a mixture of whisked eggs and pieces of sirene (white cheese) between filo pastry and then baking it in an oven. Banitsa is served for breakfast with plain yogurt. It can be eaten hot or cold. Another popular version is banitsa with spinach (spanachena banitsa). Beat the eggs, adding baking soda, keep beating and add the crumbed (or grated or crushed) cheese. Steam the grape leaves. Fry the onion in the oil until brown, add the rice, paprika, celery, and oregano and add the water. Boil until water is absorbed. Use the mixture to fill the leaves, shaping them like small bundles. Put in a pot, fill with water so the bundles are fully submerged, boil for about 45 mins on 350 F. You can bake them in the oven in a baking dish full of water instead. Best when served with some yoghurt on top. De-leaf the cabbage. Combine the onion, carrot, celery and cook in the oil until onion turns golden. Add the rice, parsley, salt and the pepper. Use the mixture to fill the leaves, shaping as small bundles. The best way to do it is to put some mixture on a big leaf, put a small leaf on top and wrap the big leaf around the small one. Put in a pot, cover with water and boil. You can bake them in the oven in a casserole pan full of water instead.